For those of us who’ve shopped the aisles of a Target, it’s easy to take the fully-stocked shelves for granted. Valencia College graduate Javier Grisales – who will, in March, enter his fourth year with the major national retailer – knows that a sparkling, abundant row of product doesn’t just happen. 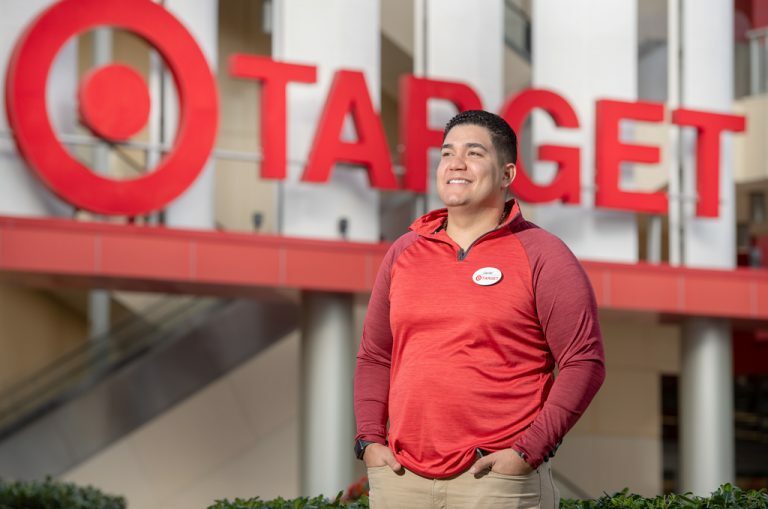 As the general merchandise leader at the Super Target nestled in Orlando’s burgeoning SoDo district, Grisales, at age 25, is in charge of the store’s logistics – and more than 30 employees who handle a truckload of goods each day. 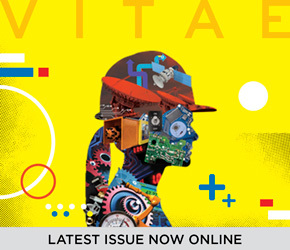 Overseeing a well-oiled machine – from loading bay to stockroom to shelve to cart to register – he never takes a fully-stocked aisle for granted. It’s such a priority, says the graduate of Valencia College and the University of Florida, that the ideal of well-stocked shelves has bled into his time off. “I can’t watch movie scenes filmed in stores without judging their shelves,” he says with a chuckle after surveying the paper aisle. Grisales began working as an intern at Target in 2015, shortly after receiving his bachelor’s degree in business marketing from UF. Just a few short years before he joined the corporate world, he was a dually-enrolled high school student in Kissimmee, attending Professional and Technical High School (PATH) and Technical Education Center Osceola (TECO) in the day and the Valencia College in the afternoon. At that time, he was working nights at Best Buy, still unsure of what he would do after high school. Coming from a low-income family, the prospect of immediately entering the workforce seemed attractive to the young Grisales. But his father reminded him to keep a focused eye on education. Struggling to choose between music production and business education, he learned that Valencia College offered both. Grisales took full advantage of all that Valencia had to offer, pursuing an Associate in Science in sound and music technology, as well as his Associate in Arts degree with a focus on business. 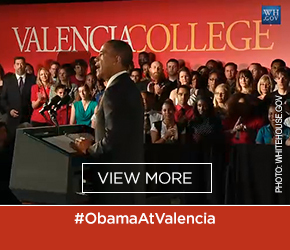 Outside of the classroom, he participated in several clubs including the Valencia Volunteers. While he ultimately chose the path of business, the music and sound technology program left an indelible mark in Grisales’ mind. One assignment, from program chair Raul Valery, tasked students with going out into the community to enlist a band that could record in Valencia College’s sound studio on East Campus. While wondering how he could accomplish such a feat while barely out of high school, Grisales was having lunch with his father on Father’s Day when he stumbled upon a salsa band, who he would invite to record on East Campus. Interacting with the working musicians and bringing a project to fruition left a lasting impact on him. As Grisales walks the aisles of Super Target in SoDo (the district south of downtown Orlando), the continued momentum is apparent. He and the staff members seamlessly transition between light-hearted small talk and the business of keeping shelves stocked and product moving out the door via the register. Grisales knows the pain of seeing items “walk out” through other means. He began working at Target in the asset protection department, which led to the occasional chase. Before long, Grisales’ supervisors promoted him to general merchandise leader – and with that came a shift in process and culture. 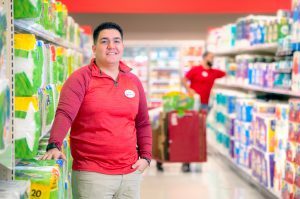 Valencia College graduate Javier Grisales in the paper aisle at the Super Target in SoDo, where he works as general merchandise lead. At the time of his promotion, Grisales noticed staff were not motivated to keep the shelves fully stocked and workflows moving in a timely fashion. Key team members were “rolling” several pallets each night, he says, meaning a substantial portion of the daily truckload would roll over into the next day’s work. It’s a practice that certainly pays off in the holiday season – or the fourth quarter, as retailers sometimes refer to it. When the truckloads triple and online orders skyrocket, Grisales is unphased by the uptick. And what about the poorly-stocked shelves that sometimes slip into frame on the silver screen? Well, they remain a thing of fiction at the Super Target in SoDo. 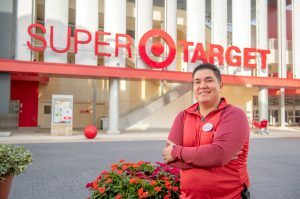 Valencia grad Javier Grisales in front of the Super Target in Orlando’s SoDo district.